The below article provides a step-by-step guide on how to create a campaign that is triggered to send out on a contacts birthday. This could also be applied to various different scenario's such as Anniversaries, Contract Renewals etc. The below example shows how to create a campaign that will send out on a contacts birthday. For this to work you will need to add two contact rules to the group one to match the day and one to match the month, this way the contact will only appear in the group once a year. 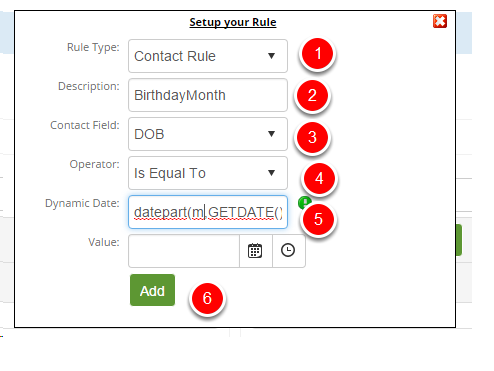 Once you have added the two rules you need to make sure that the clause used is AND, this can be selected from the drop down menu as circled. This will then get all of the contacts where their DOB day and month matches today's date. 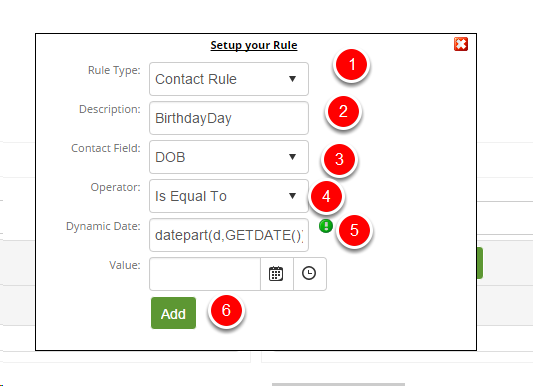 Once you have setup the rules relevant to your campaign click save. Go to Campaigns and Add a New Campaign. Set the Action Type to Static Recurring - Making sure the Recurrence Interval is set to 1 week, so it sends on a weekly basis. You can set the 'Don't Send if Received in the Last:' to 51 weeks, just to make sure they are not sent again within the same year. You will need to make sure that the End Date is set far enough in the future so that the Campaign sends all year round. Once you have done the first campaign and saved it you will then need to create another six campaigns so you have one for each day of the week. You can then copy the first one you have made but just make sure that you have the correct email design attached and most importantly change the start date to correspond to the correct day, so the campaign send on the right day.